It's the off-season, so there's nothing new to report, but here's a video that I took with my iPhone of Conor during open practice for MSOKC Race No. 5 back in June. This is the "normal" direction (counter-clockwise) at Circleville Raceway Park. The video begins with Conor exiting Turn 10 (the final corner at CRP). He crosses the Start/Finish line (marked by an orange cone) and continues through Turns 1, 2 and 3. You hear gear changes from fourth, to fifth, and then sixth. Turn 1 at CRP is flat out for most karts, including our 80cc shifter kart. The long back straightaway between Turns 4 and 5 is longer than anything between Turns 10 and 3 at CRP, but top speed (about 70 mph for Conor) generally occurs entering Turn 3. NEWS – The make-up date for the rained-out Mid State of Ohio Kart Club season finale was a week ago Sunday, October 17, 2010. Unfortunately, my work required me to be out of the country that day (Berlin, Germany, and then Sofia, Bulgaria). Peter, who has taken up the sport of Crew, had secured fourth place in the MSOKC championship in his class by simply showing up for the original date of the season finale. He had a regatta the day before the make-up date and elected to spend the day at home recovering from the extensive physical exertion that this sport requires. Conor stood to lose second place in the championship in his class if he failed to show up for the make-up date, so we recruited friends and family to give Conor the support he needed. I prepared his kart and had everything loaded up and ready to go before I left for my trip. My dad offered to accompany Conor to the track, our good friend Greg Wilkinson offered to help with the at-the-track activities, and Laura took over as scribe and caterer. While Conor was on the track, Greg provided me with live commentary via cell phone – into late Sunday evening in Berlin. PRACTICE – My first phone call didn’t come until Conor’s first heat race, so apparently everything went well during practice. I did learn later that it became apparent during practice that the run-away championship leader in Conor’s class had elected to sit out for the make-up, since he had already clinched the championship. 80cc SHIFTER – The random draw from the previous attempt at the season finale, which had Conor starting from pole position in his first heat race, was used again for the make-up. Conor got away well and settled into the lead easily in the first few corners. He and his rival for second position in the championship, who had started from the second position, quickly pulled away from the rest of the field during the first few laps. Conor was able to extend his lead by 0.1 second or so each lap. His rival backed off a bit on the last lap and Conor won by a margin of just over 2 seconds. With the order reversed for the start of the second heat, Conor would have to follow his rival through the field to avoid negating the advantage he had gained by winning the first heat. Conor’s rival managed to improve from sixth to third on the first lap (of eight) while Conor went from seventh to fifth. Both improved one more position on Lap 2. On Lap 3, Conor’s rival improved one more position into the lead, but Conor improved two positions into second. Conor reeled in the leader during Laps 4 through 6, but seemed to back off knowing that damage would be minimized by finishing right behind his rival. A first and a second earned Conor the second starting position for his feature. All Conor would need to do was finish one place behind (or ahead of) his rival to secure second place in the championship. Conor got away well again but couldn’t manage to get ahead of his rival at the start. These two traded fast laps through the first half of the 10 lap feature. The leader began to feel the pressure that Conor was applying just past half distance. Conor even pulled along side his rival on the entrance to Turn 9 after getting a good run through Turn 10 (the previous corner when going in the opposite direction) on Lap 7. Conor’s pressure paid dividends a lap later when the leader dropped two wheels into the grass on the exit of Turn 1, which allowed Conor to slip by into the lead. Conor pulled away over the next two laps for his first feature race win of the season. NEXT RACE – That’s a wrap for the 2010 MSOKC season. I was apprehensive about the boys racing in my absence, so I was pleased when Peter decided to give the make-up a miss and to see Conor do so well without me – maybe I should plan to be away more often! While Conor is highly capable on his own, his performance was enhanced by friends and family who stepped up to the plate in my absence. I hereby extend my heart-felt thanks to Greg, my dad, and Laura. Kudos also go to Greg for thinking to call me with live coverage by cell phone. 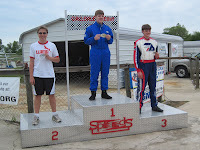 Both boys ended the season on a high note – Peter with a win and a fourth place finish that would have earned him a front row feature race starting position before the rain ruined the original attempt at the season finale, and Conor with a feature race win during the make-up that secured his second place finish in the championship. The season-ending MSOKC banquet is January 8, 2011. p.s., Lap times, lap charts, and results can be found at http://www.mylaps.com/results/showevent.jsp?id=607941. NEWS – The weather cooperated for the first 11 races of the Mid State of Ohio Kart Club season, but that streak came to an end for Race No. 12, which was supposed to be the season finale a week ago Sunday. The day dawned cool and partly cloudy, which necessitated more warm clothing than we had brought. PRACTICE – Race No. 12 was a reverse direction event at Circleville Raceway Park in which all classes would have standing starts like the shifter karts. The weather was such that neither Peter nor Conor wanted to do extra laps in the morning – both spent a significant part of the morning in the cab of the truck “doing homework”. While preparing for Race No. 12, I noticed that Conor’s throttle cable had stretched a bit to the point where it was questionable whether or not he was getting full throttle with the pedal all the way down. After this was adjusted, I decided to check Peter’s kart. With the pedal all the way down, his throttle was only three-fourths of the way open. This has certainly contributed to the fall-off in performance Peter has experienced in the later part of the season. When they finally did go out for class practice, both boys recorded some excellent lap times. YAMAHA JUNIOR – From the second starting position in his first heat race, Peter got away well and settled into second in the first few corners. He got a good run through Turn 5 on the second lap and managed to out-brake the leader going into Turn 4 (the following corner going in the reverse direction). He extended his lead over the next few laps but began to come under some pressure at about mid distance (Lap 4 of 8). Peter responded to the pressure and led to the end for his first MSOKC heat race win since Race No. 3 on May 16. Peter started his second heat race from the sixth position (of seven in his class on Sunday). He gained a position at the start and another on Lap 3. The top five karts or so in Peter’s class have become very closely matched as the season had progressed, so further progress through the field was not possible. A first and a fourth place finish would have earned Peter the second starting position for his feature race, but a steady drizzle started before that could happen and the events of the day were suspended. 80cc SHIFTER – Conor’s first heat race was much like Peter’s except that the random draw for starting positions had him starting from pole position. He made an excellent start and led easily through the first few corners. 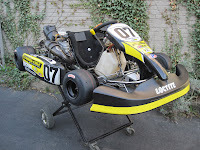 The second place kart – Conor’s rival for second place in the championship – had started on new tires. Conor also had new tires, but we had him scrub them in with a few easy laps during his second practice session. New or “sticker” tires perform best on the second or third lap, but can be dicey on the first lap. They’re okay for qualifying sessions where only one lap counts, but are not ideal for heat races. This difference in tire strategy allowed Conor to develop a fairly healthy lead on the first lap. The advantage went the other way for Laps 2 and 3, which brought the first two, and the championship leader who was in third, nose-to tail. Conor was adamant in defending his position over his rival, who tried twice to out-brake him going into Turn 4. On the second attempt, Conor had to go wide on the exit to avoid contact. These two went side-by-side through Turns 3 and 2. Conor had the better line going into Turn 1, which allowed him to reestablish the lead. Over the next few laps, the championship leader began to pressure the second place kart. These two swapped places on Lap 5, which was promising for Conor from a championship-points perspective. Conor went on to win with a buffer between himself and his rival, which would have been ideal had it not been for the drizzle that started before Conor’s second heat race. Conor’s heat race win was the first time anyone has beaten the championship leader since Race No. 5 on June 26 when Conor did it. NEXT RACE – If the final three classes could have finished their heat races either before the rain came or after it dried up (which it did eventually but after a decision had been made to suspend the events of the day), the season would have been complete (points for rained-out feature races are awarded based on earned starting positions). All Conor would have needed to do was finish one or two places behind (or ahead of) his rival to secure second place in the championship. By showing up for Race No. 12, Peter has secured his position in the championship. Because the heat races were not completed, the slate is wiped clean and a rain make-up date comes into effect, which is next Sunday, October 17. Unfortunately, my work requires me to be out of the country that day (Berlin, Germany). Friends and family have come to the rescue, however, and will see that Conor gets the support he needs during the rain make-up date. It’s going to be hard to top the way the day was going before the rain came. NEWS – Race No. 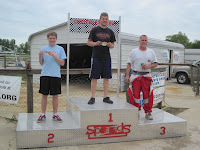 11 was the penultimate race of the 2010 MSOKC season last Sunday at Circleville Raceway Park. Peter’s position in the championship in his class is pretty well fixed, but Conor is embroiled in a battle for second place in his class. Conor entered Race No. 11, which was another qualifying format event, trailing by the slimmest of margins, but managed to improve by the end of the day. PRACTICE – We had a belated birthday celebration for Conor’s 18th birthday at Japanese Steak House in the Short North area of Columbus the Friday before Race No. 11. All five of us (including Laura’s sister Kathy who was visiting from Kansas City) eventually succumbed to a healthy dose of food poisoning, but it hit each of us at different times. Laura was sick right away. It didn’t hit Kathy and me until the next day. Fortunately, both boys still felt reasonably well on Sunday morning. They practiced well with both recording reasonable lap times. They had to do much of the work required to get two karts on the track themselves as I spent time lying down in the back seat of the truck. Both Peter and Conor succumbed early the following week. YAMAHA JUNIOR – The 2006 Margay Brava 1.6 chassis that Peter uses seems to like cooler conditions, which is what we had for Race No. 11. After qualifying sixth during the previous race, he improved to fourth in qualifying for Race No. 11. In his heat race, he improved his position by one at the start and held on all the way to the finish while keeping the leaders in his sights. The first lap of Peter’s feature race didn’t go so well. He didn’t quite time the start right and lost a position going into Turn 1. He lost another position in Turn 5 on the first lap. He had the speed to regain the position going in to Turn 10, but left the door open on the inside and lost another position. His qualifying position and heat race result took possible points away from his closest rival, so his feature race result – a respectable sixth – did not make much of a difference. Peter has to do little more than show up for Race No. 12 to claim fourth place in the championship. 80cc SHIFTER – I’m thinking about starting to call Conor “Mr. Excitement”. He easily posted the second fastest time during his qualifying session, two places ahead of his closest rival. Qualifying events tend to be processional affairs – if everyone gets a good start – which would have had him finishing second all day. Well, Conor bogged the engine down at the start of his heat race and lost two places. He pulled off an excellent pass on his rival in Turn 5 on Lap 5. He pulled out a gap but ran out of laps before he could further improve his position. From the third starting position in his feature race, Conor held his position at the start, but missed a shift in Turn 4, which caused him to loose a position to his rival in Turn 5. After several attempts, he regained the position on Lap 7. On Lap 9, the second place kart retired with a mechanical problem, which resulted in a second place finish for Conor. p.s., Lap times, lap charts, and results can be found at http://www.mylaps.com/results/showevent.jsp?id=600458. MSOKC Race No. 10 – September 4, 2010 – Hog Roast! NEWS – MSOKC Race No. 10 was another qualifying format event at Circleville Raceway Park on Saturday, September 4, 2010. The event followed the normal Sunday (day race) schedule to allow time in the afternoon/evening for the annual MSOKC Hog Roast, which involved plenty of food for everyone and a variety of games. There was also a Powder Puff race in the rental karts at CRP for wives, girlfriends, and mothers of the regular racers. Laura was apprehensive about entering at first, but eventually warmed up to the idea. PRACTICE – It was Conor’s turn to re-acclimate, as he had missed Race No. 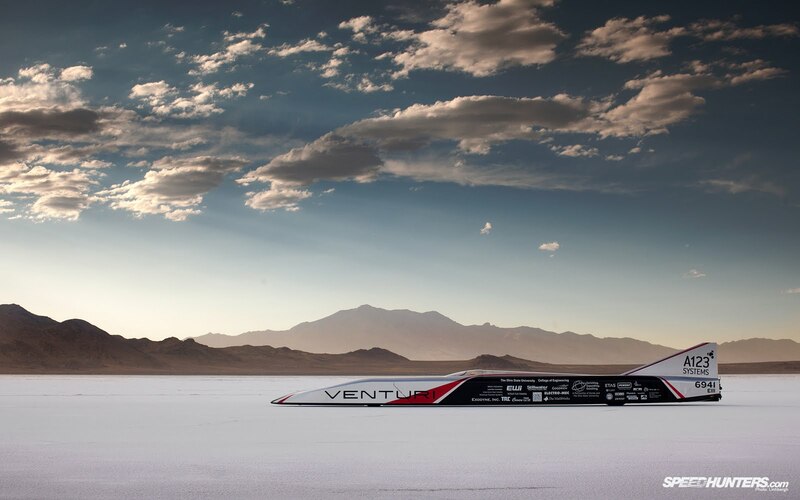 9 while at the Bonneville Salt Flats helping a student-based team from The Ohio State University's Center for Automotive Research break the Land Speed Record for electric-powered vehicles. Both boys practiced on used tires and saved their new tires for the qualifying session. YAMAHA JUNIOR – Peter’s qualifying time was only a half second slower than the pole position time, but the competition in this class is such that this resulted in a sixth place starting position for his heat race. Qualifying format events tend to be processional affairs and that was exactly the case for Peter’s heat race. Everyone completed the first lap in the same order in which they qualified and they ran in that order to the finish. In Peter’s feature race, he was able to improve one position during the start. He managed to keep the kart he passed at the start behind him for the full distance for a fifth place finish. 80cc SHIFTER – Conor’s class was split into two groups for qualifying. He went out third in the first group. One of the slower karts in the class had gone out first, but Conor allowed what he thought was a sufficient amount before taking to the track. On his third lap, which was his fastest, he caught the slower kart exiting Turn 10 and had to take evasive action, which cost him about a tenth of a second. He qualified third, but catching the slower kart ended up costing him a position – the margin being 0.057 seconds. Conor’s heat race was also a processional affair with everyone finishing where they started. Conor provided the excitement during his feature race. He bogged his engine during the standing start and dropped to sixth place in the process. He made a pass for fifth on Lap 2, fourth on Lap 4, and managed to work his way back up to third on Lap 8, recording the second fastest lap time in the process. POWDER PUFF – Laura suited up in Conor’s garb for the Powder Puff race (see picture below – click to enlarge). This event has gained popularity since it was introduced during the Hog Roast event in 2008. There were 27 entries in 2010, which required four separate heat races. The top two finishers in each heat would transfer to the feature. Laura had never driven one of the rental karts at CRP, so she was at a significant disadvantage. She managed to work her way up to some respectable lap times, but did not manage to transfer to the feature. We’ll be sure to arrange some practice laps for her prior to next year’s event. NEXT RACE – MSOKC race No. 11 is another qualifying format event at CRP on Sunday, September 26, 2010. Peter’s position in the championship is pretty well fixed, but Conor fell from second to third after Race No. 10 by the slimmest of margins. We’ll do our best to get him three clean laps during the qualifying session on Sunday. p.s., Lap times, lap charts, and results can be found at http://www.mylaps.com/results/showevent.jsp?id=589263. I found a great deal on E-Z Up shelters at Cabela's, so I bought two to replace the ones we lost during the Commercial Point Grand Prix. We tried them out at Circleville Raceway Park during Mid State of Ohio Kart Club Race No. 10 last Saturday (see pictures below - click to enlarge). I was actually able to salvage one of the old ones by combining parts from the two twisted ones, so now we have a spare. A full race report for MSOKC Race No. 10 will follow soon. NEWS – For the third time this season, Bruce Brothers Racing had only one kart to look after during a race day. For Mid State of Ohio Kart Club Race No 9 on August 22, 2010, Conor was at the Bonneville Salt Flats in Utah where he was a member of a student-based team from The Ohio State University's Center for Automotive Research that succeeded in breaking the International Land Speed Record for electric-powered vehicles (see related posts below). Peter had just returned from a trip to Chicago with Laura and Henry where they spent time seeing the sights with Laura’s mom and her brother and his family. Since Race No. 9 was a reverse direction event at Circleville Raceway Park, Peter really didn’t want to miss this one as he tends to do well in this direction. Laura agreed to drive through the night from Chicago to get him to the track on time. PRACTICE – Peter decided to re-acclimate to the reverse direction by running some practice laps during the early-morning open practice session. I’m glad that he did, too, because during his second (and final) class practice session, the throttle return spring on his carburetor broke which left him stranded on the track. Without the early-morning session, the spring may have broken during his first heat race, which would have been much worse. During the practice laps that he did manage to complete, his lap times were some of the fastest in his class. YAMAHA JUNIOR – The random draw for starting positions had Peter starting from near the rear in his first heat race (sixth of nine) and from pole position in the second. In his first heat race, Peter made a great start and made his way up to fourth on the first lap, but dropped a position on Lap 3 (of eight). Peter was getting out of Turn 5 leading onto the long back straightaway well. He was also managing to late-brake into the following corner (Turn 4 going in the reverse direction). He used this to his advantage on Lap 5, diving to the inside at the approach to Turn 4, but the other kart moved over on Peter even though Peter had earned the position. These two tangled which dropped Peter to sixth position, which is where he finished. Peter made another great start from pole position in his second heat race and led easily for the first two laps. He lost some ground to the second place kart on Lap 3. The second place kart proceeded to punt Peter off the track with an optimistic passing attempt in Turn 6. This would definitely have earned the other kart a black flag – if the corner worker had been looking in that direction. The result of this tangle dropped Peter to fourth. He dropped another position on Lap 4 but made up a position on Lap 6 for a fourth place finish. Both of Peter’s heat race incidents resulted in either Peter’s kart on top of the other kart or the other kart on top of Peters, which can be very dangerous. I had a discussion about rough driving with the Race Director during the intermission. The Race Director in turn summoned all of the participants in Peter’s class for a stern talking to prior to the start of the feature races. This seemed to have the desired effect, as there was much less action in Peter’s feature race. Peter started fifth and ran in fifth to the finish. This could have been a very productive day for Peter if he had not been batted around like a ping-pong ball during his heat races. 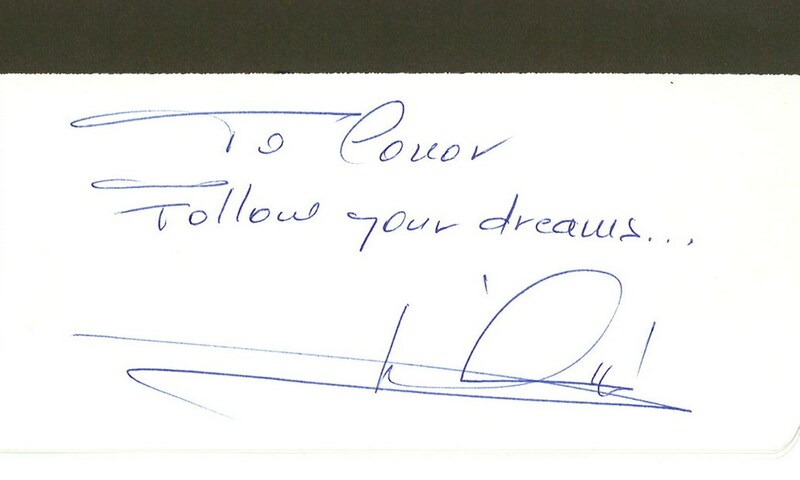 I’m hoping that the effect of the Race Director’s message will follow through for the remainder of the season. NEXT RACE – MSOKC race No. 10, which is another qualifying format event, is this Saturday, September 4, 2010, at CRP. This event will follow the normal Sunday (day race) schedule to allow time in the evening for the annual MSOKC Hog Roast, which will involve plenty of food for everyone and a variety of games. In the mean time, Conor is back from Utah and all three boys are back in school – Henry for his Junior year at Brown University and Conor and Peter for their Senior and Freshman years, respectfully, at Upper Arlington High School. p.s., Lap times, lap charts, and results can be found at http://www.mylaps.com/results/showevent.jsp?id=583487. 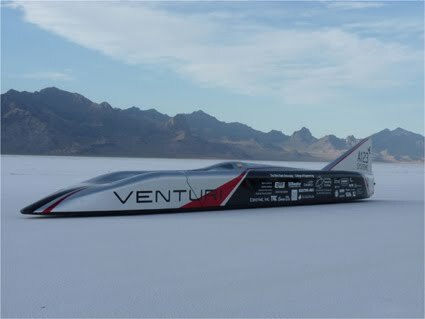 On Monday, August 24, 2010, the Venturi Buckeye Bullet 2.5 set a FIA (international) Land Speed Record for electric-powered cars of 307 mph! The record was set over a 60-minute period and consists of the average of two runs over a timed mile in the middle of a 12-mile course on the Bonneville Salt Flats in Utah. The previous record of 245 MPH was set by White Lightning in 1999. While the original Buckeye Bullet set an SCTA (national) record at 314 mph, this record does not meet FIA specifications. Bruce Brothers Racing is extremely proud of the team, including our own Conor Bruce, for this monumental achievement. A video clip that Conor took of the BB 2.5 returning to the pit area and a parting shot of Conor on the salt are shown below. Here are some additional pictures from the 2010 CPGP (click to enlarge). What an E-Z Up canopy looks like inside out. Henry during practice before the storm. Conor preparing for his practice session. Peter ready for his heat race. The start of Peter's heat race. Conor debriefs the crew chief. Conor looks on as Peter lines up for his feature race. Peter gets away quickly at the start of his feature race. Conor gets away quickly at the start of his pro race. NEWS – The Commercial Point Grand Prix of Karting, which is a street race through the village of Commercial Point, Ohio, that benefits the Jackson Township Fireman's Association, has always been the highlight of the season for Bruce Brothers Racing. This year was no different. It can be challenging, because unlike our club races, the event proceeds rain or shine and damage to the karts is more likely because of the straw bales that line the circuit. While weather was definitely a factor this year, there were no incidents with the bales for Bruce Brothers Racing. We had planned to run three drivers in two karts like last year, but after the weather did its thing on Saturday, Henry decided that he would rather spend what little time he has left of the summer with friends before going back to school. PRACTICE – Practice is about all we got accomplished on Saturday, which had been slated to include a qualifying session and a heat race as well. The sky began to darken after Peter finished his practice session. The wind began to pick up and rain drops about the size of marbles began to fall. We scrambled to get everything that was sitting out either into the bed of the truck or the trailer. The two E-Z Up canopies that we have normally provide reasonable shelter from the rain, but on this day, the rain decided to come down sideways. During the worst of it, the canopies began to act like airfoils. Even though they were staked down, it took all of us just to hold on to them. Just as it became apparent that the one Laura was holding onto was about to take her away with it (Dorothy!!! ), the part she was holding onto broke and it went sailing. The other one was right behind it. With nothing left to hold onto and no more shelter, everyone piled into either the bed of the truck or the trailer. I made it into the cab of the truck and remember worrying that the trailer and its precious cargo were going to go next! After it subsided, the pit area was littered with the remains of canopies – close to 50 of them – along with various motor home awnings and other bits and pieces. Unfortunately, one of our canopies landed on Laura’s new car and did a significant amount of damage. The track dried up faster that the recovery efforts in the pit area, so practice resumed without having to resort to rain tires. All three boys came up to speed quickly during their practice sessions. As preparations were being made for the qualifying session, the skies opened up again. It became apparent rather quickly that the delays caused by the weather were going to preclude any further on-track action, so the remainder of the events scheduled for the day was postponed until the following day. YAMAHA JUNIOR – During his practice session, there was one kart in particular that seemed to be able to keep up with Peter, so we decided that he should go out behind her in the qualifying session on Sunday morning. It’s often advantageous to have a target to shoot at. This seemed to work out perfectly, as Peter posted the fastest qualifying time – by a scant 0.066 seconds. To make up some time, the organizers elected to forgo the traditional Le Mans style standing start (used for most of the classes at the CPGP) for the heat races in favor of a rolling start. Peter timed the start well, but had to concede the lead in Turn 1. Our choice of gear ratio resulted in a bit more top speed than the lead kart down the 900 ft long front straightaway. Peter used the slipstream at the end of Lap 2 and took the leader deep into Turn 1. She went in a bit too deep and got sideways on the exit. Peter had the momentum to get by but these two touched briefly, which let the third place kart slip into the lead and the previous leader back around Peter. Peter and the previous leader both got around the new leader on the next lap. On Lap 6 (of 8), Peter made an excellent (and apparently unexpected) inside move going into the revised-for-2010 Turn 6. This turn had been a very fast sweeper but was made into a sharp turn with a run-off area to keep speeds down and encourage passing. Well, it worked. Peter completed the remaining two laps uncontested for a comfortable win. With the weather cooperating and a sufficient amount of time made up, the organizers went back to a Le Mans style start for the feature races. We had done some work on Peter’s clutch leading up to the CPGP, and that seemed to work, too. He pulled away easily at the start and continued to pull away lap after lap. Even though he acknowledged my signals to back off a bit, he continued to improve his lap times. Peter won comfortably and his fastest lap time was set on his final lap. 80cc SHIFTER – Conor also went out second in his qualifying session. We’d have been perfectly happy with the second fastest qualifying time, but one other kart snuck in a flyer, which resulted in the third fastest qualifying time for Conor. Since the 80cc Shifter karts have a manually-actuated clutch, they use a Formula 1 style standing start regardless of what the other classes do. At the start of Conor’s heat race, I saw him sit there momentarily while everyone else took off. I later learned that he was watching the wrong flagman! The flagman who lined them up and the head flagman are similar in build and were both wearing a bright orange official tee-shirt, so Conor was surprised when everyone left without him when the guy he was watching didn’t throw the green flag. He quickly selected first gear and got going, but this dropped him to last (eighth) in the process. He eventually worked his way back up to third at the finish, and seemed to have a fun time doing it. The first few places came easily, but the closer he got to the front, the more difficult the passes became. Unfortunately, the organizers lost the MyLaps data for this event before it was posted, so I don’t have a record of which passes came on what laps. Conor had his eyes on the correct flagman for his feature race and maintained his third place starting position into Turn 1. The first two almost had a coming together in Turn 1 at the start. He made a pass for second at about mid distance when the kart ahead of him kart slowed slightly with a mechanical problem but then got reeled in by another kart towards the end. He finished third again, but reported that his brakes seemed to be dragging towards the end. Conor was also entered in the Pro race in his class, where a $500 purse was at stake. After a through brake cleaning, he once again lined up in third for the start. While the leader got away, Conor applied a significant amount of pressure to the second place kart over the first few laps. The second place kart pushed too hard and ended up in the run-off area for Turn 6. Conor cruised home to a second place finish in the Pro race and collected a $250 check for his efforts. NEXT RACE – Peter achieved a perfect result at the CPGP in 2010, duplicating the feat that Conor accomplished in 2008. Conor had a rough start to the event, but managed to pad his bank account in the end. Bruce Brothers Racing would like to extend a heartfelt thanks to all of our friends and family who braved the elements on Saturday. Maybe 2011 will be the year for the relaxing picnic atmosphere at the CPGP that Laura was hoping for! Our next event is Mid State of Ohio Kart Club Race No. 9 on Sunday, August 22, 2010, at Circleville Raceway Park. Peter will just have returned from a trip to Chicago with Laura and Henry where they have been seeing the sights with Laura’s mom and her brother and his family. Conor will still be at the Bonneville Salt Flats in Utah where he is a member of a student-based team from The Ohio State University's Center for Automotive Research that is attempting to break the Land Speed Record for electric-powered vehicles, so he will miss Race No. 9. Note the Bruce Brothers Racing sticker on the side of the Venturi Buckeye Bullet 2.5 (inside yellow circle in picture below - click to enlarge). Conor took the picture at the bottom. 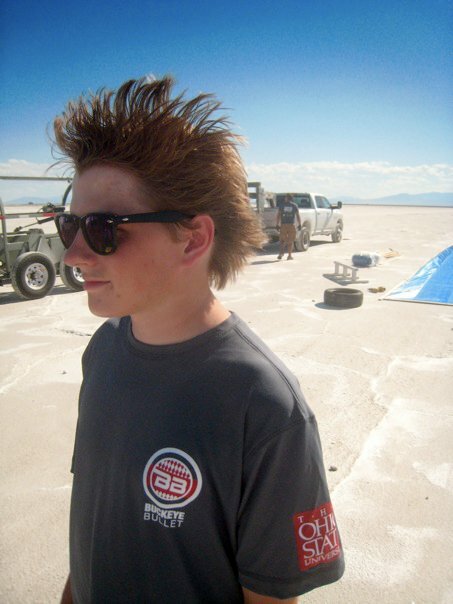 Conor is at the Bonneville Salt Flats in Utah this week for a Land Speed Record attempt, not driving his kart, but as part of a student-based team from The Ohio State University's Center for Automotive Research (CAR). Conor has spent his weekdays (and many weeknights) this summer as an un-paid intern at CAR working with the Buckeye Bullet team. The Buckeye Bullet is the world's fastest electric-powered car(http://www.buckeyebullet.com/). The team will attempt to break their own record of 314.958 mph with the current iteration of the car - the Venturi Buckeye Bullet 2.5. 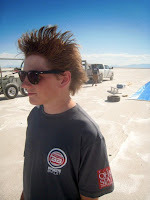 Conor is one of only two high school students to ever be invited to join the team on the salt in Bonneville. I'll post updates as they become available (click pictures below to enlarge). Here are a few pictures from the 2010 CPGP (click to enlarge). A full race report will follow. Peter takes the green flag in Yamaha Junior qualifying. Conor (No. 07) lines up for the start of his heat race. Peter with his trophy on the top step of the podium. Conor on the second step of the podium next to Eric Fagan. The tentative schedule for the 2010 Commercial Point Grand Prix of Karting (http://cpgrandprix.com/) is shown below. Unfortunately, it's not very detailed. The second practice session on Saturday also serves as a qualifying session. There is only one practice session on Sunday. NEWS – Argh! I hate it when I screw up. If Mid State of Ohio Kart Club (MSOKC) Race No. 7 was mediocre for Bruce Brothers Racing three Sundays ago, Race No. 8 two Sundays ago was a disaster – for Conor anyway. Peter struggled a bit early but managed to work his way onto the podium for his feature race. Conor’s qualifying time would have earned him the second starting position, but when he crossed the scales, he was underweight and was disqualified! This put him behind the eight ball for the rest of the day. The worst part is that it was my fault – argh! PRACTICE – Race No. 8 was a qualifying format event. We had made significant changes to both karts looking for a bit more speed, including a top-end engine rebuild for Conor and a carburetor and clutch rebuild for Peter, so practice was our chance to try these out. These changes were okay, but for some reason, I was thinking that the minimum required weight for Conor’s class was 360 instead of 370 lbs, so when he came across the scales at 365 lbs during practice with an almost empty fuel tank, we decided to remove some of the lead weight and replace that weight with additional fuel. This seemed to make sense since Conor has been eating like a horse in an effort to gain some weight. Peter was still complaining about too much grip in the rear, so we experimented with short hubs on his rear axle during practice. This didn’t seem to have the desired effect, so we went back to the medium-length hubs and made a tire pressure adjustment for his qualifying session. YAMAHA JUNIOR – Peter’s qualifying time was less than 0.5 seconds off of the fastest qualifier in this class, but the level of competition is such that this resulted in a sixth place starting position for his heat race. Race No. 8 was also an event that featured standing starts for all classes. Peter got away reasonably well at the start of his heat race, but was not able to move forward, indicating that there was still too much grip, and finished sixth. For his feature race, we made a radical tire pressure adjustment that seemed to help. Peter made an excellent pass in Turn 10 on Lap 1 and then benefited from a retirement on Lap 3 for a fourth place finish. One of the karts in front of him was a visitor on non-club-spec tires and was disqualified at the end of the day, which promoted Peter to the third place position on the podium. 80cc SHIFTER – Conor posted the second fastest qualifying time by nearly 0.4 seconds. Because he was underweight, not only was his time disallowed, but he was awarded zero points for his qualifying session. This meant that he would not only start from the rear in his heat race, but that the “zero” would also affect his feature race starting position. Conor made an impressive run through the field in his heat race moving from eighth to fifth on the first lap He gained another position on Lap 3 for a fourth place finish while quickly catching two of the karts in front of him. From the rear again in his feature race, he got bottled up behind a group of karts fighting for position. He made his way around two of these on Lap 2 and another on Lap 3. He fought hard with the fourth place kart for the remainder of the laps – pulling along side on several occasions – but could not find a way past and eventually finished fifth. Conor was the second fastest kart all day, but was not able to capitalize on this. 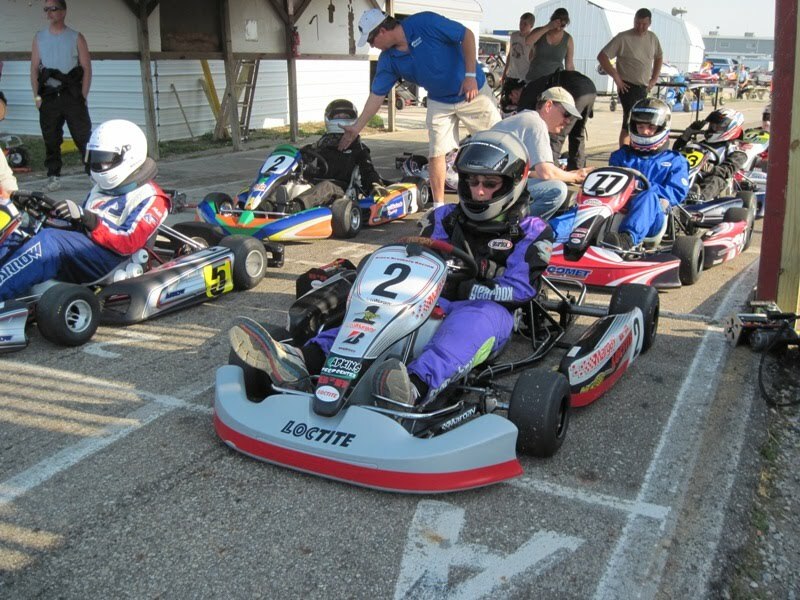 NEXT RACE – The next event for Bruce Brothers Racing is this coming weekend (August 14-15, 2010) – the Commercial Point Grand Prix of Karting, which is a street race through the village of Commercial Point, Ohio. Conor will contest the 80cc Shifter class and Peter and Henry will double up in our Yamaha SuperCan kart – Peter in the Junior division and Henry in the adult Heavy division. All three boys will race on both Saturday and Sunday and Conor will race twice on Sunday. Admission is free, but passes must be purchased to access the pits. Extra chairs will be on hand in our pit area. There will be food vendors, beer wagons, etc., and all proceeds benefit the Scioto Township Firemen’s Association. Commercial Point is located approximately 14 miles south of Columbus, just south of Grove City. This will be our only non-MSOKC event of the season. Because it is a non-club event, the rules allow any tire to be used, so we have some sticky ones mounted on both karts for the low-grip surface of a street circuit. p.s., Lap times, lap charts, and results can be found here: http://www.mylaps.com/results/showevent.jsp?id=565396. NEWS – Peter is home from his four week trip to Italy, where he spent most of his time lounging on a beach on the northwest coast of the island of Sardinia. When I was 14 years old, I got to spend part of the summer on the southwest shore of Buckeye Lake! In any event, it’s good to have him home. We had what can best be described as a mediocre day at the race track for Mid State of Ohio Kart Club (MSOKC) Race No. 7 on Sunday, July 25, 2010. Both Peter and Conor had some great dices during the day, but we came away knowing we had left some valuable championship points on the table. None-the-less, we had our usual enjoyable day. The day dawned much cooler than the day before, but the skies opened up not long after we had unloaded. This postponed the order of events by about two hours. So that everyone could get home at a reasonable hour, the number of laps was shortened from eight and ten to six and eight for the heat races and feature race, respectively. This would work both for and against us as the day progressed – Conor needing more laps in his feature race and Peter needing less. PRACTICE – The washing that the track got before practice began meant that no lap records were going to be broken on Sunday. Less than ideal atmospheric conditions, which changed as the day wore on, and re-rubbering of the track necessitated many chassis and engine changes throughout the day to stay on top. We experimented with different setups during practice. Peter had badly damaged his right front spindle in his most recent feature race (Race No. 4), so he had a chance to try out the repaired one during practice and to break in his new tires. YAMAHA JUNIOR – The random draw for starting positions had Peter starting in the third position for his first heat race (of seven karts in his class). He was lined up behind a relative newcomer but with good equipment. I advised Peter to stay behind the pole sitter in an effort to pass the second place starter in the first corner and then the pole sitter in Turn 4. That turned out to be bad advice. The pole sitter checked up in the first turn which resulted in Peter dropping all the way back to sixth by Turn 4. On Lap 3, Peter got a good run through Turns 9 and 10 and managed to pull out a double pass going into Turn 1 on Lap 4. This resulted in a fourth place finish. There was a pileup in Turn 3 on the first lap of Peter’s second heat race, in which he started fifth. The action occurred ahead of Peter. He managed to miss it and advanced to third in the process. He got around Turn 9 well again on Lap 2 and dove to the inside in Turn 10 to take over the second position. These two ran nose to tail for the remainder of the distance with Peter hanging on for a second place finish. A fourth and a second earned Peter the third starting position for the feature. Peter had complained that his kart was too tight during his second heat, so we made a slight adjustment to loosen it up. Unfortunately, this was not enough. Peter held his position at the start, but the two in front began to draw away fairly quickly. One of the karts involved in the second heat pileup caught Peter on Lap 2 and got around him on Lap 3. He completed the laps in a comfortable fourth place. 80cc SHIFTER – Conor started from pole position in his first heat race. He led into Turn 1 and began to pull away a bit over the next few laps. The series leader, who had started from the rear, caught and passed Conor on Lap 4. Conor had to defend his position for the remainder of the laps to bring home a second place finish. In the second heat, it was Conor’s turn to start from the rear (seventh). He gained a position at the start, and two more on Lap 2. He was faster than the next kart in line but ran out of laps and finished fourth. A second and a fourth earned Conor the third starting position for the feature. He made a great start, but the second place starter dove to the inside to keep Conor behind in Turn 1. On Lap 3, it was Conor’s turn to get around Turn 9 well and dive to the inside in Turn 10 take over the second position. He pulled away slightly, but it was apparent that he was pushing hard to do so. After loosing a position by locking the rears during Race No. 6, Conor had been nudging his brake bias forward all day. He must have gone a bit too far because he locked the fronts in Turn 3 on Lap 5 and took a detour through the grass. This was enough to let the kart behind through. Conor caught back up in the next lap, and made one last ditch effort to regain the position in Turn 10 on the last lap, but came up about a kart length short for a third place finish. NEXT RACE – In the week leading up to MSOKC Race No. 8, which is Sunday, August 1, 2010, both Henry and Peter had birthdays – 21 and 15 years, respectfully (how can that be?). For Race No. 8, which is a qualifying format event with standing starts for everyone, Peter got a carburetor and clutch rebuild and Conor got a top-end engine rebuild. After that, there is a much-needed two week break prior to the Commercial Point Grand Prix, which is August 14-15, 2010. p.s., Lap times, lap charts, and results can be found here: http://www.mylaps.com/results/showevent.jsp?id=569762. NEWS – There can be no delay in these next few race reports as Mid State of Ohio Kart Club (MSOKC) Race No. 6 on Saturday, July 17, 2010, was the first of three races on consecutive weekends for Bruce Brothers Racing and the first of five races in a six week span. Peter was still in Italy, so once again had only one kart to look after during Race No. 6, which was a night race that followed the qualifying event format. PRACTICE – We had made a few changes to Conor’s kart for Race No. 6, so he tried these out during practice but saved his new set of tires for the qualifying session. New tires seem to have a “golden lap” in them on about the third lap. The first two laps scrub off the mold release and scuff them in, and then after the golden lap, the performance begins to fall off a bit. 80cc SHIFTER – There were 10 karts in Conor’s class for Race No. 6, so the class was split into two groups for the three-lap qualifying session. Conor went out first in his group and took his time coming up to speed on new tires. The kart that went out behind Conor didn’t maintain a proper gap during the warm-up lap. Conor got one clean lap in before the kart behind passed him in Turn 5 on the second lap. This spoiled Conor’s second lap, and because of a misunderstanding in the tower, the checkered flag was given after the end of the second lap. So much for our planning around the golden lap! Needless to say, I was not happy, but the circumstances were the same for everyone. It didn’t make much difference either, because Conor was 0.4 seconds (i.e., a significant amount) behind the eventual pole sitter (the kart that passed Conor, which was also on new tires) and nearly 2 seconds (i.e., an eternity) faster than the next fastest kart. After qualifying second, Conor made an excellent start in his first heat race, nearly jumping the pole sitter but settling into second in the first turn. He ran within sight of the eventual winner for a comfortable second place finish. Starting from second in his feature, he did jump the pole sitter at the start. His lead was short lived, however. Much to his own dismay, he had neglected to mind his brake bias, which was not far enough forward, and locked the rears going into Turn 5 on the first lap. After the pass, he again settled into second and ran within sight of the eventual winner for another comfortable second place finish. NEXT RACE – Qualifying format events do tend to be processional affairs, which was certainly the case for MSOKC Race No. 6. I’m not sure what else we can do to get Conor a feature race win it 2010. We seem to have squeezed every bit of speed out of the equipment that we have. We are content to be ahead of the rest of the field, however. Peter will be back in action for MSOKC Race No. 7 on Sunday, July 24, 2010, which is a regular direction event at Circleville Raceway Park. It’s good to have him home. p.s., Lap times, lap charts, and results can be found at http://www.mylaps.com/results/showevent.jsp?id=567152. NEWS – The best news of all first – Conor and I have just returned from University of Iowa Children’s Hospital in Iowa City where Conor had his annual check-up from the spinal surgery he had there three years ago. Dr. Menezes was thoroughly impressed with Conor’s condition and gave him a clean bill of health. While there are still some things that he will never be able to do (play football, wrestle, jump on trampolines), Conor was told that he doesn’t ever have to return unless he begins to have problems again. So ends a very trying chapter in the life of the Bruce family… Now back to racing – Mid State of Ohio Kart Club (MSOKC) Race No. 5 on Saturday, June 26, 2010, was our first night race of the season at Circleville Raceway Park (CRP). These events are intended to make use of the cooler evening hours, but while the morning was relatively cool, temperatures rose significantly throughout the day and then it ended up raining on us in the evening. PRACTICE – It’s been quite a while since we had only one kart to look after during a race day, but that’s just what we had for Race No. 5. Peter is spending the better part of a month this summer in Italy. We had planned to put Henry in our Yamaha SuperCan kart during Peter’s two-race absence, but he decided that the potential enjoyment wasn’t worth the expenditure involved. Also, Henry is working full time during the week this summer and wanted to spend time that weekend with friends. Conor had new tires for Race No. 5. As usual, we had him practice initially using an older set that we have mounted on a duplicate set of rims. At least I thought they were a duplicate set. We discovered that the hub offset is different on the fronts of one set compared to the other, which explains the difference in handling we’ve been experiencing between practice and race conditions. We would struggle with lack of rear grip (too much front grip) during practice, only to have it sort itself out during race conditions – or vice-versa, which was worse. With this under control, and with new tires and a carburetor adjustment that seemed to help, Conor was easily turning laps in the 44 second range during his second practice session. 80cc SHIFTER – The random draw for starting positions had Conor starting from pole position in his first heat race. He didn’t get away from the standing start as cleanly as he has been and was squeezed out of the lead in Turn 1. Further back in the field, two karts made wheel-to-wheel contact with one being launched into the hay bales on the outside in Turn 1. Everyone was okay, but fortunately for Conor, this caused a red flag condition which meant that the race would be restarted. Conor got away much more cleanly during the restart and led easily into Turn 1. He immediately began to pull away and developed a fairly large gap back to second place. At about mid distance (Lap 4 of 8), he backed off a bit to save his tires yet still continued to pull away. He won easily and recorded the fastest lap time in the process (44.781 seconds and the only kart in the 44 second range). Conor made another great start from the rear (sixth of seven) in his second heat. He immediately began slicing through the field and was up to third by the end of the first lap. The two karts in front of him were involved in what would become an epic dual for the lead. Conor was right on their tail and waited for his opportunity, but it never came. He had the speed to be more offensive, but seemed to be content knowing that a third place finish would give him a front row starting position for the feature. The rain came just as the starting lineups for the feature were being posted. After it became apparent that the rain was not going to let up, points for the feature were awarded based on earned starting position, which resulted in second place points for Conor. This was a bit disappointing since Conor seemed to have the speed for his first feature race win of the season. NEXT RACE – The MSOKC schedule for the first part of the season has been rather spread out this year. By the time that Race No. 6 rolls around on Saturday, July 17, 2010, we will have had after another three week break. Race No. 6 will be another night race at CRP but with a qualifying format, in which we seem to do well. Peter will still be in Italy (he returns July 19), so unless Henry has a change of heart, we will once again have only one kart to look after. Beginning with Race No. 6, we have five races in a six week span, which includes a two-day event – the Commercial Point Grand Prix on August 14-15, 2010. p.s., Lap times, lap charts, and results can be found at http://www.mylaps.com/results/showevent.jsp?id=557628. The CPGP will take place August 14-15, 2010, through the streets of Commercial Point, Ohio. Bruce Brothers racing will have three entrants in four classes - Peter in Yamaha Junior Lite, Conor in 80cc shifter (trophy and pro classes), and Henry in Yamaha Heavy. NEWS – The start of the 2010 Mid State of Ohio Kart Club (MSOKC) season had been remarkable for Bruce Brothers Racing until Race No. 4 on Sunday, June 6, 2010. This was the first race of the season without any twists – regular direction, rolling starts (except shifter karts), heat race format, and daytime schedule. While we seem to do well when there is a twist involved, there was no reason to suspect that we’d have a difficult day for Race No. 4. Sometimes, it’s just your turn for a bit of bad luck, and for both Peter and Conor, it was apparently their time. Both were fast all day, qualified reasonably well for their feature, but were involved in a series of incidents that resulted in less than desirable overall results for the day. 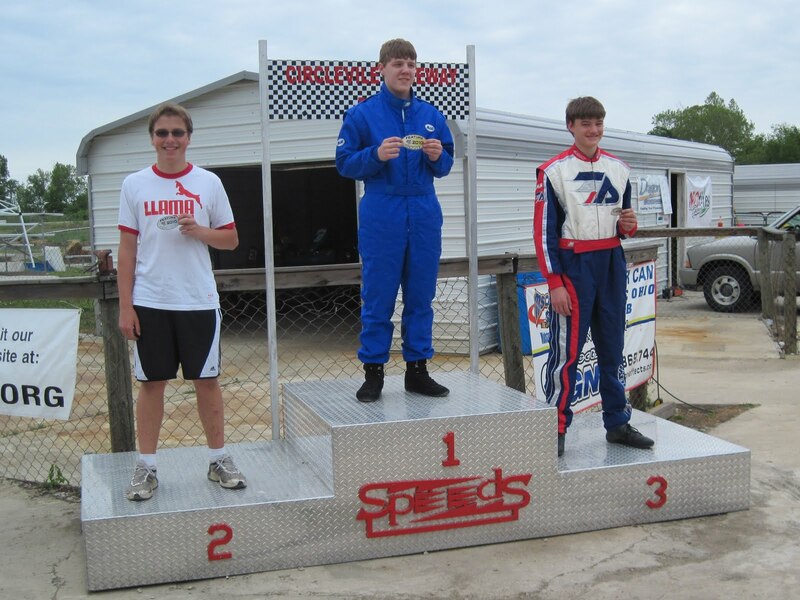 Peter tangled with a spinning kart in his feature race and Conor was taken out twice – once while leading a heat race and again in his feature. PRACTICE – It was pouring down rain when we arrived at Circleville Raceway Park (CRP) on Sunday morning, but the forecast called for clearing skies. It cleared up at about 10:00 AM and practice got underway about an hour later than normal. This was Peter’s fourth race on his initial set of MG “Red” tires. While they are holding up quite well, he was at a slight disadvantage to those who had new or newer tires for this race. Conor’s second set had only race laps from Race No. 3 on them, so he was in excellent shape tire-wise. During practice, we experimented with gear ratios on both karts to account for the big headwind that was blowing down the long back straightaway. YAMAHA JUNIOR – There were nine karts in Peter’s class on Sunday, two of which would be disqualified at the end of the day for non-club-spec tires. From the fourth starting position in his first heat race, he made one pass on the first lap. While trying to get by the next kart in the queue, he left the door open in Turn 10 and dropped back to fourth. After he finally did make the pass back into third, he set the fastest lap of the race (46.855 seconds). Peter also gained one position (from sixth to fifth) at the start of his second heat race. He lost a position on Lap 2, gained one on Lap 4, and lost one on Lap 5 to finish where he started – in sixth. Through all of this, he somehow managed to set the fastest lap of the race again (46.777). A third and a sixth resulted in a fifth place starting position for his feature race. He once again gained a position at the start. On Lap 2, the second place kart spun ahead of Peter in Turn 9. I thought that this was going to promote Peter to as high as second, but the spinning kart ended up right in front of him and Peter hit him hard. This deranged the nose of his kart slightly and dropped him back to seventh, after which he had trouble getting around a slower (and somewhat erratic) kart. He finished in seventh but was promoted to sixth after the tire disqualifications. 80cc SHIFTER – Conor made a great start from outside the front row in his first heat race, leading easily into Turn 1. The pole sitter had dropped back at the start but began to catch Conor at the end of the first lap. The second place kart made an aggressive move to the inside of Conor in Turn 5 on Lap 2. There was contact and both karts went into the grass. Conor had to get out and push to get going again, which dropped him to last. The offending kart received a rolled black flag (warning) and the driver apologized profusely afterwards for taking Conor out while he was leading. Conor also gained one position (from fifth to fourth) at the start of his second heat race. He was passed by the eventual winner on Lap 2 but made the position back up on the same lap by passing another kart. He spent the remaining laps embroiled in a battle with a slower kart. These two traded places on Lap 6, but Conor was not able to make the pass stick. A fifth and a fourth was good enough for a fourth place starting position for the feature. Conor once again made a great start and was up on the third place starter by nearly a kart length entering Turn 1, but the third place starter failed to concede the position. The right front tire of the offending kart hit Conor just ahead of his left rear, which sent Conor into the grass again. It took him more than a minute to get going again, which ended his hopes of salvaging some valuable championship points for the day. NEXT RACE – After another three week break, during which we are visiting family in Kansas City, our first night race of the season is MSOKC Race No. 5 on Saturday, June 26, 2010, at CRP. Gates open at 1:00 PM and racing gets underway at 5:00 PM. In the mean time, school is out for the summer for Peter and Conor, and Henry is home from college. Conor will begin a summer internship at Center for Automotive Research at OSU when we return to Columbus and Henry has already started his summer job at the James Cancer Hospital at OSU. Peter will be spending about a month in Italy this summer (Rome, then the island of Sardinia) with our neighbors and good friends the Rizzoni family, so Henry will be contesting the MSOKC Yamaha SuperCan Heavy class during Peter’s two-race absence. p.s., Lap times, lap charts, and results can be found at http://www.mylaps.com/results/showevent.jsp?id=546502. NEWS – Mid State of Ohio Kart Club (MSOKC) Race No. 3 on Sunday, May 16, 2010, was the first of several reverse-direction (clockwise) events at Circleville Raceway Park (CRP) this season. Both Conor and Peter enjoy the variety that this brings, as CRP is a much different race track in this direction. The end of the long straightaway brings a near-hairpin turn in this direction, which emphasizes hard braking in the primary passing zone. The final turn in this direction (the normal Turn 1) is a very fast right-hander that takes courage to do flat out. For the third race in a row, we won heat races (both Conor and Peter this time) and both boys ended up on the podium in the feature. Conor also earned his first feature race pole position of the season. PRACTICE – The new club-spec MG “Red” tires have held up pretty well on our Yamaha SuperCan kart (Peter), but we decided that the first set on our 80cc Shifter kart (Conor) wasn’t going to make it for three races. For Race No. 3, we rotated the tires on Peter’s kart and mounted up a new set for Conor. We saved Conor’s new set for his first heat race, however, and had him practice on his old set. Both boys acclimated quickly to the reverse direction during practice, although there are muscles that get used in this direction (seven rights three lefts) that don’t get used to a great extent in the other direction (seven lefts and three rights), particularly in the neck and torso. YAMAHA JUNIOR – Peter made a great start from the fourth position (of eight in his class) at the start of his first heat race, moving to second in the first few turns. He was able to go much deeper into the turn at the end of the long straightaway (the normal Turn 4) than the leader and made a pass for the lead on Lap 4 (of eight). He went on to record another heat race win – his third in three events this season. There was a delay in the start of Peter’s second heat race when one of his competitors had trouble getting started. When the green flag finally did fly, Peter’s row was a bit behind the other row, and Peter dropped from fifth to sixth. It took Peter until Lap 6 to get past one kart and then he made another pass on the final lap for a fourth place finish. A first and a fourth earned him the third starting position for the feature. He held his position at the start, after which the first three separated themselves from the pack, running nose-to-tail. The second place kart passed the leader on lap seven (of 10) and Peter was able to do the same on Lap 8. Peter was right on the tail of the new leader for the last two laps. He pulled along side at the end of the long straightaway on the final lap, but couldn’t make the pass stick. He was disappointed not to get the win, but was happy to record another second place feature race finish. He also recorded the fastest lap of the race (47.048 seconds). 80cc SHIFTER – Once again, Conor’s first heat was almost a carbon copy of Peter’s. He started from the fourth position (of nine) and gained two positions at the start. He passed the leader at the end of the long straightaway on Lap 2 and went on for a comfortable heat race win. Conor was fortunate to end up where he did in his second heat race. He made a great start from the sixth position, but the lead kart missed a shift in the second turn (the normal Turn 9) on the first lap, which caused an accordion effect. Conor hit the kart in front of him rather hard, and while this deranged his nose slightly, it did not slow him down. He actually gained several positions on this lap, which put him up to third. On Lap 8, the second place kart got a bit sideways in final turn (the normal Turn 1) and Conor was able to muscle his way past in the next two corners. A first and a second earned Conor the pole position for his feature race. His start wasn’t his best of the day, and the second place kart was able to go side-by-side with Conor through the first turn, which put the other kart on the inside for the following turn. Conor wisely conceded the position and latched onto the tail of the leader. He was able to keep pace with the leader for the first few laps but then seemed to back off a bit then it became apparent that there was no way he was going to retake the lead. This was fine until the third place kart began to catch him in the late stages. After fending off several passing attempts, Conor also recorded another second place feature race finish. NEXT RACE – After another three week break, which includes the Memorial Day holiday, MSOKC Race No. 4 is Sunday, June 6, 2010. p.s., Lap times, lap charts, and results can be found at http://www.mylaps.com/results/showevent.jsp?id=536499. NEWS – April showers have brought May flowers to Central Ohio, and showers are exactly what we had two weeks ago for Mid State of Ohio Kart Club (MSOKC) Race No. 2 at Circleville Raceway Park (CRP), which featured standing starts for all classes (like the 80cc Shifter class). We did manage to squeeze in two heat races, which is all it takes to make an official race day. As with Race No. 1, Peter again won a heat race and both boys ended up on the podium. PRACTICE – When we unloaded after Race No. 1, I noticed that a significant chunk of Peter’s clutch was missing. This has since been repaired, but because the track was damp when we arrived for Race No. 2, we weren’t able to test the repairs prior to the scheduled practice sessions. Once these did start, we were able to successfully do the fine tuning on the fly. Conor’s practice sessions were less busy, as we are trying to minimize the number of laps on his race tires. The skies looked ominous again by this time, and because of the impending rain, a decision was made to shorten the heat races from eight laps to six. YAMAHA JUNIOR – The random draw for starting positions had Peter starting from pole position in his first heat race. He timed the standing start perfectly and was comfortably in the lead going into Turn 1. He maintained a gap over the rest for the first lap or so, but once the second and third place positions were established, these two began to catch Peter. The second place kart made a dive to the inside on the last corner of the last lap but came up short, which gave Peter a heat race win in each of the two events this season. Peter started from the back (sixth of six) in his second heat. The third place kart jumped the start but the flagman must have been looking the other way, as no penalty was given. Peter advanced one position at the start and another on Lap 3. With only six laps to work with, that’s all the further he was able to advance. A first and a fourth earned Peter the third starting position for the feature. When the rain finally did come, points for the feature were awarded based on earned starting positions, which resulted in another podium finish for Peter. 80cc SHIFTER – Conor also drew starting positions for his heat races at each end of the field, although he started his first heat from the rear (eighth of eight). He got away well and made two passes on the first lap. Another pass on Lap 2 brought him to fifth, which is where he finished. Conor also made an excellent start from pole position in his second heat race. He led for the first half lap or so before he was passed by the eventual winner (and winner of every heat/feature so far this season). Conor was able to keep the leader in his sights for a comfortable second place finish. A fifth and a second were good enough for the second starting position for the feature. This class was actually lined up on the grid when the rain finally came to stay. Conor also recorded another podium finish as the result of points for the feature being awarded based on earned starting positions. NEWS – Bruce Brothers Racing had an excellent season debut for Mid State of Ohio Kart Club (MSOKC) Race No. 1 at Circleville Raceway Park (CRP) a week ago Sunday. We qualified both karts on the front row, Peter won a heat race, and both boys ended up on the podium. PRACTICE – We managed to get in two practice days prior to Race No. 1 – one to shake out the cobwebs and the other to do some fine tuning. Off-season changes included a complete engine rebuild on our Yamaha SuperCan kart (Peter) and a significant reconfiguration of our 8Occ shifter kart (Conor). MSOKC also has a new club spec tire for 2010 – MG “Reds” instead of Bridgestone YJCs. We used old tires for our first practice day and scrubbed in and tested the new MG Reds on the second practice day. On Sunday morning, we did a bit of fine tuning and were feeling in pretty good shape. YAMAHA JUNIOR – Race No. 1 was a qualifying format race, which means that starting positions for the subsequent heat race would be determined by best lap times during a three-lap qualifying session. Peter’s lap times had been good during practice, so we were optimistic for qualifying. There were nine karts in Peter’s class, so they split the session into two groups. Peter went out in the second group and posted the second fastest overall time (46.650 seconds). In his heat race, he timed the start perfectly from outside the front row and lead easily into Turn 1. Just about the time he began to receive pressure from behind, there was an incident involving two karts running towards the end of the field and the race was red flagged. Everyone was okay, but since the leaders had completed half of the laps (four of eight), the race was not restarted, which gave the win to Peter. A second and a first earned Peter pole position for the start of his feature race. As Peter demonstrated in the heat race, the outside starting position on the front row is sometimes a better place to be. At the start of the feature, he had to concede Turn 1 and dropped in behind the new leader. Except for one retirement, the first four ran nose to tail for 10 laps. Peter finished second but did record the fastest lap of the race in the process. The outlook for the season is looking bright for Peter. 8Occ SHIFTER – Our 8Occ shifter kart got front brakes over the winter, a rear axle upgrade, and a top-end engine rebuild. Conor seemed to have liked the changes during our practice days, so we were optimistic on Sunday for him as well. 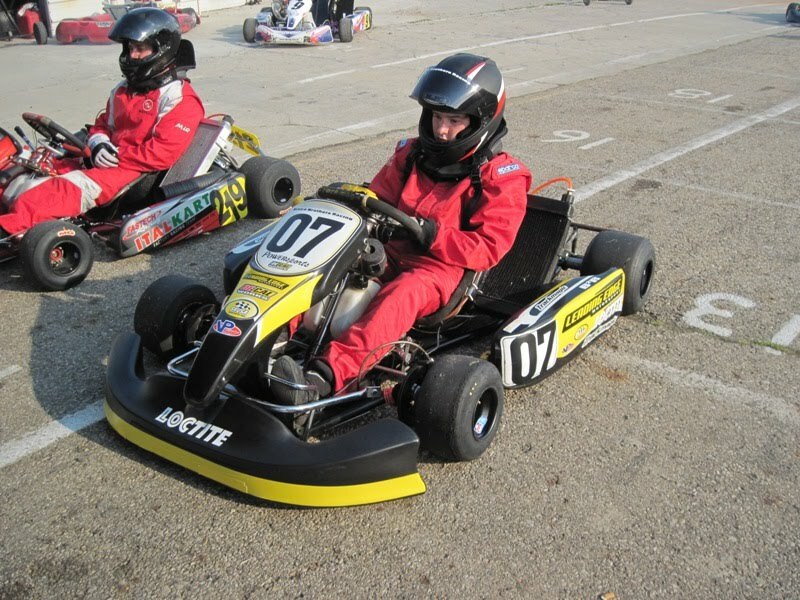 His qualifying session was also split into two groups – five karts in each. Conor also posted the second fastest qualifying time – he and one other kart were the only ones to break into the 44 second range (44.992 for Conor). While he had done well with his standing starts during practice, he muffed the one for his heat race. He got away immediately, but bogged the engine down and dropped to fifth. While the leaders got away, it took Conor seven laps to get around the fourth place kart. A second and a fourth was good enough for a third place start for the feature. He made an excellent start in the feature, but had to back off a bit to avoid the pole-sitter in Turn 1 (see video below). He settled into third and pressured the second place kart all the way to the end for a third place finish. The outlook for the season is also looking bright for Conor. We were particularly pleased with the reliability of his kart in light of all the changes that were made over the winter. NEXT RACE – MSOKC Race No. 2, which will feature standing starts for all classes (like the 8Occ Shifter class), is Sunday, April 25, 2010 at CRP. This video is from the start of Conor's feature race a week ago Sunday. He is the black and yellow kart on the inside of the second row. Peter lines up for his pole position start in his heat race. Conor prepares himself for his heat race. It seems like Christmas was only a month or so ago, but somehow, Easter has come and gone. Since Christmas, Laura and Peter have been to Peru for a tournament with Peter’s soccer team and Conor and I have been to Australia for the Australian Grand Prix. Henry was home for a few days of Spring Break with some of his Brown University friends. The racing season for Bruce Brothers Racing gets underway this Sunday with Mid-State of Ohio Kart Club (MSOKC) Race No. 1 at Circleville Raceway Park. Peter will contest the Yamaha Jr. SuperCan class again in 2010 and Conor will contest the 80cc Shifter class again. 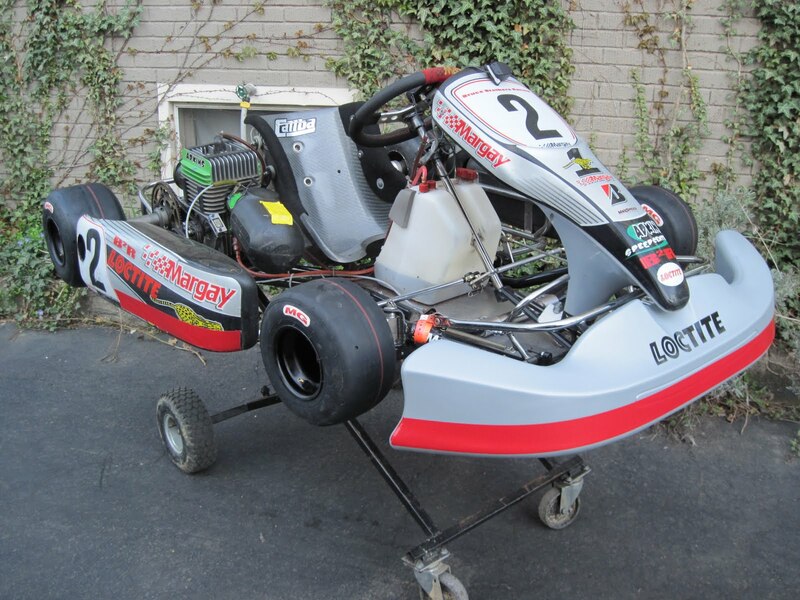 Both karts have fresh engines and we have made some significant updates to our 80cc Shifter kart – some cosmetic (new bodywork - see earlier post) and some more significant (larger diameter rear axle and front brakes). CRP is located on U.S. Route 23 just north of Circleville (click here). There is quite a bit of footage of Peter (silver No. 2 kart with a red stripe on the nose). He first appears at about 15 seconds in.